Whenever a new TD is received, add it to list No, 02. As TDs are complied with, annotate list No. 02 with the TD status code to the left of the Series (SER) column, and add the information to list No. 04. This provides a complete and up-to-date configuration listing of the aircraft at any given time. 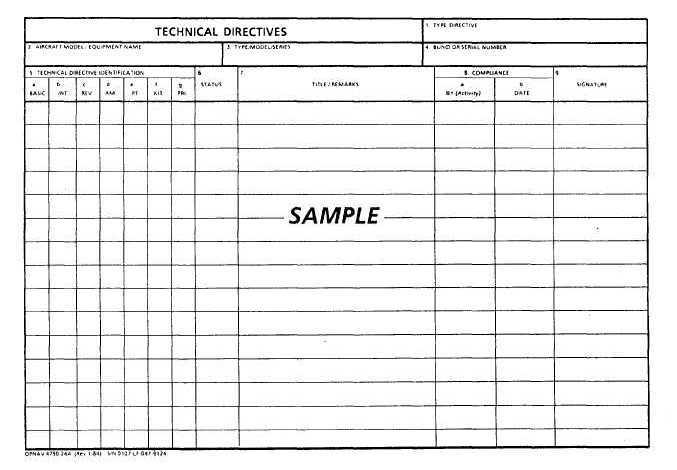 Interim-type directives are recorded on the same sheet as the formal directives and identified by an I in the interim column. When cancellation instructions in an interim directive indicate that it will be superseded by a regular directive, you should enter, in pencil, the regular directive number on the following line with temporary status code not incorporated (NINC). TDs that affect a component for which an SRC, EHR, ASR, or MSR is required are also recorded in the TD part of that record (double entry). In this instance, the TD identification is entered, and a notation to see the applicable SRC, EHR, ASR, or MSR is entered in the Title/ Remarks column. All technical directives are logged in numerical sequence except on pages titled Revisions. Revisions are logged in the order in which they are received. In some instances, information on previously issued TDs may be issued as a new TD or a revision to a specific TD. You account for this type of directive in the technical directives section as follows: Enter the number of the TD (or revision), followed by the notation "Information only," together with the identity of the activity and an authorizing signature. Initiation and maintenance of the Technical Directives form are described in the following paragraphs. You should refer to figure 6-6 as you read these paragraphs. Figure 6-6. - Technical Directives.